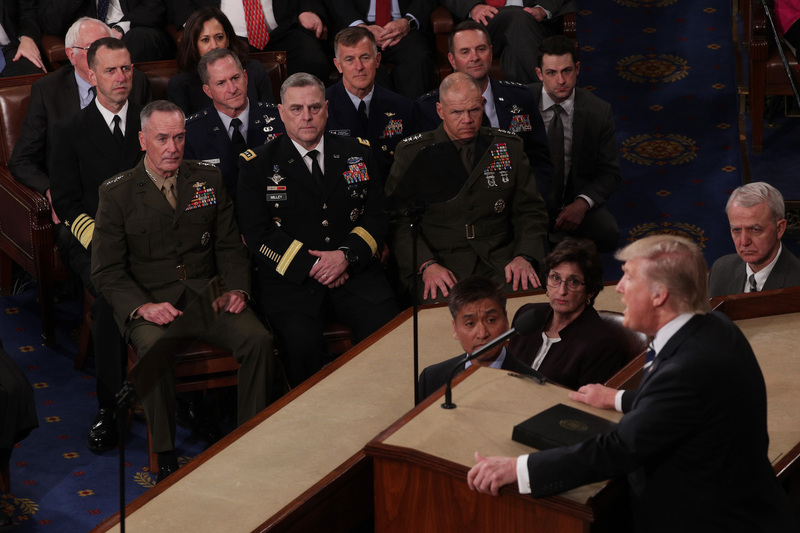 Chairman of the Joint Chiefs of Staff General Joseph Dunford (front row, left) and the Joint Chiefs of Staff look on as U.S. President Donald Trump addresses a joint session of the U.S. Congress in the House Chamber of the U.S. Capitol in Washington, D.C., February 28, 2017. This article is an edited version of remarks first delivered at a discussion of “Avoiding War with China” at the Elliott School of International Affairs, George Washington University, on May 1, 2017. The context in which these contingencies might occur reflects an imbalance of power left over from history. U.S. forces are forward-deployed along China’s frontiers in a pattern that originated with the Cold War policy of “containment.” Chinese forces are deployed to defend China’s borders as China defines them. China regards the United States as the country most able and likely to violate those borders and attack it. The United States seeks to sustain the military dominance of the Western Pacific that it has enjoyed since its 1945 overthrow of Japanese imperial power. Washington is determined to preclude the contraction of the sphere of influence it established during the Cold War. China is striving to establish defensible maritime borders, to prevent Japan, Malaysia, the Philippines, and Vietnam from prevailing in their counterclaims to islands and rocks in its near seas, and to reintegrate Taiwan, which the United States separated from the rest of China and placed in its sphere of influence 67 years ago, in 1950. Elements of the U.S. military aggressively patrol the air and seas that abut China. Their purpose is to be ready to cripple the People’s Liberation Army (PLA) by striking bases in its homeland if conflict with U.S. forces or U.S. allies occurs. Not surprisingly, China objects to these missions. It is steadily strengthening its capacity not just to fend off American attempts to scout or penetrate its defenses, but to recover Taiwan by coercive means. The U.S. armed forces and the PLA have met on the battlefield before, but never on Chinese soil. Sino-American wars have taken place only in third countries like Korea or by proxy and covert action, as in Indochina. But any war between the United States and China under the contingencies both now contemplate would begin in places China considers part of its territory. It might be possible to limit a conflict in the South China Sea to the islands and waters there. But a Sino-Japanese clash over the Senkaku (Diaoyu) Islands or a Sino-American war over Taiwan would almost certainly entail U.S. strikes on the Chinese mainland. Chinese doctrine calls for such attacks to be answered with reprisals against U.S. bases and the American homeland. China’s no-first-use doctrine is a significant barrier to China’s use of nuclear weapons for such reprisal, but one that it is easy to imagine being breached under the pressures of wartime crisis conditions. Beijing is likely to see U.S. attacks on Chinese bases where nuclear and non-nuclear weapons are commingled as the equivalent of a strategic first strike designed to knock out China’s nuclear deterrent. Any threat that China’s Communist Party leadership perceives as existential would stimulate some to argue for nuclear as well as cyber reprisal against comparable facilities in the United States. In the U.S. political elite and officer corps, alarm about the damage a nuclear strike can wreak on its targets and the retaliation it invites has succumbed to “nuclear amnesia.” The national “allergy” to the use of nuclear weapons has weakened concomitantly. Washington is again exploring tactical uses for nuclear weapons and funding programs to develop them. Americans have ceased to consider what a nuclear exchange with Russia, China, or another foreign foe would do to the United States. The current hysteria over north Korea may in time correct this. But, for now, Americans remain in denial, imagining that, despite all the evidence to the contrary, the U.S. missile defense program will work. No one is preparing for scenarios in which it does not. Meanwhile, communication between the American and Chinese national security establishments is far less robust than it was between the U.S. and USSR during the Cold War. There is very little, if any, mutual trust between Beijing and Washington. Senior U.S. military officers understand Chinese politico-military doctrine poorly or not at all. There are no Sino-American understandings or mechanisms for escalation control. It is past time, but not too late to begin creating these. Under the People’s Republic, China has established a seven-decade-long record of strategic caution and a preference for diplomatic and paramilitary rather than military solutions to national security problems. China clearly prefers to use measures short of war to protect itself, but has shown that it is fully prepared to go to war to defend its borders and strategic interests. Chinese uses of force have been notably purposive, determined, disciplined, and focused on limited objectives, with no moving of the goalposts. In Korea, where ragtag Chinese forces fought the United States to a standstill from 1950 to 1953, China settled for the de facto restoration of the status quo ante bellum—strategic denial of the northern half of the Korean Peninsula to hostile forces. In 1958, it ended its military presence in Korea. When border skirmishes escalated into war between China and India in 1962, China first showed India that, if provoked, the PLA could overrun it. Then, having made that point, China withdrew its troops to their original positions. In the 1979 Sino-Vietnamese war, China accepted huge losses on the battlefield to teach Vietnam that the costs of continued empire building in association with the Soviet Union would be unacceptably high. Once Vietnam seemed convinced of this, China disengaged its forces. China waited a decade to respond to multiple seizures of disputed islands and reefs in the South China Sea by other claimants. The Philippines began the process of creating facts in the sea in 1978, Vietnam followed in 1982, and Malaysia did the same in 1983. In 1988, China intervened to halt the further expansion of Vietnamese holdings. Since then, China has established an unejectable presence of its own on seven artificially enlarged land features in the South China Sea. It has not attempted to dislodge other claimants from any of the four dozen outposts they have planted in Chinese-claimed territories. China has been careful not to provoke military confrontations with them or with the U.S. Navy, despite the latter’s swaggering assertiveness. A similar pattern of restraint has been evident in the Senkaku Islands, which China considers to be part of Taiwan and Japan asserts are part of Okinawa. There, China seeks to present an active challenge to Japanese efforts to foreclose discussion of the two sides’ dispute over sovereignty. It has done so with lightly armed Coast Guard vessels rather than with the PLA’s naval warfare arm. Japan has been equally cautious. China negotiated the reunification of both Hong Kong and Macau, although it could have used force, as India did in Goa, to achieve reintegration. China has negotiated generous settlements and demarcations of its land borders with Afghanistan, Kazakhstan, Kyrgyzstan, Nepal, Pakistan, Russia, Tajikistan, and Vietnam. China’s borders with the former British empire in Bhutan, India, and Myanmar remain formally unsettled but for the most part peaceful. These interactions between China and its neighbors demonstrate a high degree of Chinese competence at managing differences without armed conflict. They provide grounds for optimism. War, including accidental war, between China and its neighbors—or China and the United States as the ally of some of those neighbors—is far from inevitable. China has been cautious even with respect to Taiwan—that most chauvinist of issues. There has been no exchange of fire between the civil-war rivals on opposite sides of the Taiwan Strait since 1979. On January 1 of that year, the United States accepted Beijing as China’s capital and ended its formal championship of Taipei in that role. Beijing responded by discontinuing its advocacy of the forceful “liberation” of Taiwan and announcing a policy aimed at peaceful reunification. So far, despite occasional provocations from pro-independence forces in Taiwan, China has stuck with this policy, placing equal emphasis on enticement and intimidation. Beijing’s “united front” outreach to the Taiwanese complements the military pressure its growing capacity to devastate the island imparts to the imperative of cross-Strait accommodation. The bottom line is that while Chinese warnings must be taken seriously, Chinese aggressiveness should not be overestimated. China tends to act militarily with prudence, upon warning, not rashly. Its wealth and power are growing, giving it an incentive to defer confrontations to the future, when its relative strength will be greater and new opportunities to win without fighting may arise. The record shows that China adheres to limited objectives, limited means, and limited time scales. On the other hand, it is characteristically determined, once the die is cast, to invest whatever level of effort is required to achieve its objectives. China has been notably careful to avoid “mission creep” in the wake of success. There is no evidence that its ambitions are open-ended or unbridled. If given an inch, it is unlikely to seek to take a mile. So, what’s the problem? Why are we concerned about how to avoid war with China? There are two reasons, one short-term and one long-term. The first relates to Taiwan, which the United States has pledged to help defend. The island is now ruled by an anti-reunification, pro-independence government. Trump administration statements have raised doubts about whether Washington might upgrade relations with Taipei, relitigate the U.S. commitment to a “one-China” policy, or otherwise change direction on this most neuralgic of all issues for Chinese nationalism. China now has the military means to bring Taiwan to heel despite U.S. opposition. The uncertainties injected by Mr. Trump’s tweets seem to have moved Beijing to consider whether to act before the issue goes off track. It is entirely possible that once this fall’s 19th Party Congress has passed, arguments for resolving the question of Taiwan’s relationship to the rest of China by the 100th anniversary of the founding Chinese Communist Party in 2021 will gain force. If so, the long-deferred bloody rendezvous of the United States with Chinese nationalism could be upon us as Beijing makes Taipei “an offer it cannot refuse.” Americans will have to decide how invested we are in our Cold War commitment to keep China divided. In the longer term, while Washington persists in proceeding on the assumption that the United States can forever dominate China’s periphery, this notion has steadily diminishing credibility in Asia. America’s power is visibly declining, not just in relation to China but also to the increasingly self-reliant allies and friends of the United States in the region. These trends give every sign of accelerating. They reflect underlying realities that increased U.S. defense spending cannot alter or reverse. Sino-American rivalry—political, economic, and military—seems destined to intensify. China can and will easily match defense budget plus-ups by the United States. Despite much shadowboxing by the U.S. armed forces, American military primacy in the Western Pacific will gradually waste away. Both the costs of U.S. trans-Pacific engagement and the risks of armed conflict will rise. The states of the region will hedge. They will either draw closer to Beijing, cleave to Washington, or—more likely—try to get out of the middle between Chinese and Americans. For the most part, they will not repudiate their alliances with America. Why give up something for nothing? But they will rely less on the United States and act more independently of it. So the central question in whether the United States can avoid war with China comes down to this: How much damage to our homeland are we prepared to risk to pursue specific foreign policy objectives that antagonize China? In the 21st century, when Americans kill faraway foreigners, we must expect that they will retaliate and that, one way or another, we will pay a price in civilian deaths here at home.